Madonna. What more needs to be said? 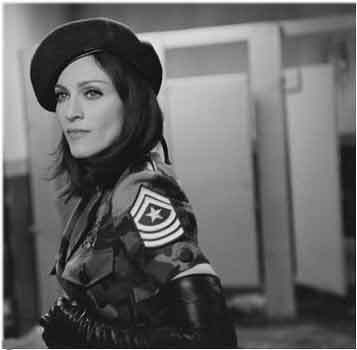 LAUNCH executive editor Dave Di Martino recently had the pleasure of getting together with the icon in a posh Beverly Hills hotel suite prior to the release of American Life. Unfortunately for Di Martino, there were approximately 20 other people also in the suite. Undaunted at the prospect of performing in front of a crowd, Di Martino nonetheless attempted to have an intimate conversation with the singer/actress/legend. Madonna kicked things off by saying, "Hello Dave Di Martino!," thrilling the interviewer beyond belief. In fact, he's hoping that the cameras were rolling during that moment so he can listen to it over and over again. During the interview DiMartino managed to ask a few questions without Madonna thinking he was there to "take advantage of her." Here's the rest of their conversation. LAUNCH: To your ears, what's the greatest artist difference or leap on American Life? MADONNA: I think that I've definitely have improved as a songwriter. I think that my songwriting has improved, and I think a lot of that has a lot to do with that I've been writing everything on the guitar since I've been playing the guitar for the last few years. LAUNCH: Did working on other projects affect the making of the album? MADONNA: When I worked on this record I didn't do a one-fell-swoop scenario. I kept stopping to do other things. I stopped to do a play in London, so the things I was working on had time to gel, and go back and make changes, then I stopped to do the James Bond song--that was a several-month ordeal--then I stopped to promote my film that I did with my husband, and a lot of things happened and I had a lot of experience and it kept coming back to work on my record, and all of those experiences informed the music and what I was writing about. LAUNCH: How do you feel about the war in Iraq and the controversy surrounding the "American Life" video clip? MADONNA: Well, I think the war that's going on in Iraq right now is affecting everything. I think everyone is glued to their television, nobody knows what's going on, everybody's scared. I don't think that people are as concerned as they usually are consumed as they are being entertained or distracted, you know what I mean? And that's kind of what the video is about, 'cause it starts out with the ultimate distraction--a fashion show, cat walk, beautiful people, perfect male, female six-foot Amazon Uber people. As a society, we've become obsessed with obtaining that image or aspiring to it. But I needed that as juxtaposition to what's really happening in the world. If it's not the war in Iraq, it's any number of wars that are going on at any given time, and that dichotomy the paradox that's going on in our lives right now, 'cause on the one hand, life has become so convenient for everyone. The technological advances that we've made have made everything, time, space, and motion collapse and disappear. But on the other hand, there's never been more chaos in the world, and the video is like, 'Oh, ok, this is happening, what are we going to do about it? And the video is question that I pose to everyone. And, I do I think, I think in a way everything is happening perfectly. And it's synonymous, there's a poetry to it, I mean I was planning this video and the concept last November and I didn't know we were going to where we are right now at the time of the release of my album. LAUNCH: You do a lot of things really well, what do you think you're most comfortable doing, or are really good at? MADONNA: I think I'm a really good dancer. LAUNCH: Is there anything that you feel you've been unfairly maligned for that you feel you shouldn't have been? MADONNA: Well, I think people are unbelievably cruel when it comes to critiquing or revealing the films that I've been in, at least they have been for the last few. I don't think they were reviewing the films, I think that they were personally attacking me, and it's obvious, they don't even try to hide it. LAUNCH: Do you think that you would enjoy your life a little more if you could walk around and no one would recognize you? MADONNA: I don't. I mean, I think I would be happy if a lot of other things happened before the not being famous part. That's the least of my problems. LAUNCH: Has anyone given you advice that has stuck with you that has helped you deal with the enormity of your fame? MADONNA: I can't say that any advice that anyone gave me specifically, 'cause no one gave me advice about being famous as I was coming up. But I like what Gabriel Garcia Lorca said, and that was, "Fame is a form of misunderstanding. That sticks with me." LAUNCH: Is there anything from a career perspective, looking back, that you think was a smart thing to do? MADONNA: I think it was really smart to learn how to play the guitar. I think it was really smart of me to have had the luck to hook up with Mirwais and William Orbit and a lot of really talented musicians, writers, and producers that I have worked with throughout the years. I think I have a good sense of that. That's another good thing I'm good at, finding talent. LAUNCH: Are you interested in the private lives of well-known people? LAUNCH: Can you relate to the fact that people want to know so much about you? MADONNA: I don't want to know about other people as much as people want to know about me. LAUNCH: There's a line in the song "Hollywood" that says, "I'm bored with the concept of right and wrong." Now that you're a mother, does right and wrong play into raising your children? MADONNA: Yeah, but with that is the whole concept of being politically correct. That's a bit irritating. LAUNCH: Looking back at your career is there one thing that you would characterize as the most exciting? MADONNA: Definitely, the first time I was ever on tour, like the first show I ever did, I remember remember really well. It was in Seattle, Washington, I was promoting the Like A Virgin album, walking out on stage for the first time, I'll never forget that. And then I've had moments here and there, in the course of my career�The Blond Ambition Tour, and doing the film Evita and learning to sing all of that music, making the film, the whole experience, and just over the last few years learning to be a musician myself, I would say, and all the amazing people that I've had the merit to work with, those are all high points. LAUNCH: Is there a danger or fear of what might happen with your career as you get older? MADONNA: I mean if you lose interest in something, the chances are you'll find interest in something else. I'm not afraid of that. LAUNCH: Everyone that you've probably met over the last 15 years probably wants something from you. How do you feel about the idea of that? MADONNA: Yeah, but some people actually want to give me stuff too, and that's a good thing. LAUNCH: Are you well adjusted to that give and take? MADONNA: I try to steer clear, I mean this is circuitry here, you're asking me questions, but I'm here to talk about my record, so we're both getting something out of it. So, I don't think that you're taking advantage of me or something.